Publication: Elliott, Maud Howe, ed. (1854-1948) Art and Handicraft in the Woman's Building of the World's Columbian Exposition, Chicago, 1893. Chicago and New York: Rand, McNally & Company, 1894. pp. 312-316. THE exhibit made by Belgium in the Woman's Building was collected by a committee under the patronage of Her Majesty the Queen of the Belgians. The honorary president, the Countess of Flanders, is well known not only as a patron of the arts and industries of women, but as a painter herself. The president, Mme. de Denterghen, is maid of honor to the Queen; the other officers and members of the committee are all women whose high positions have enabled them to gather together the very valuable collection which is installed in that section of the Woman's Building devoted to Belgium. The arrangement of the space is very charming. Passing under some finely wrought hangings, the work and gift of Belgian working-women, the visitor finds himself in a salon, hung with good pictures, and filled with cases containing fine examples of china-painting, fan-painting and mounting, miniatures, embroideries, and laces. The best known of the contemporaneous women painters, Mme. Ronner, is represented by one of her inimitable paintings of a group of cats, which hangs in the Hall of Honor. Other people have painted cats, but Mme. Ronner stands to-day as the most famous cat painter in the world. She has studied the habits and character of her favorite animal, and understands cat and kitten nature thoroughly. The standard of excellence of the painters represented is very high; out of the twenty artists who exhibit their work in the Woman's Building, eleven have taken honors at other important exhibitions. A group of etchings by the Countess of Flanders has received much well-merited praise, while the single small piece of sculpture, a plow-horse, by the Comtesse d'Espiennes, makes the visitor wish to see more of her strong, sympathetic work. Some excellent examples of china-painting are exhibited by the School of the Rue de Marais at Brussels. The ecclesiastic embroideries of Mlle. Dennis are worthy of attention, and the white embroideries of Mme. de Kerchove de Naeyer are masterpieces of delicate stitchery. PROPERTY OF HER MAJESTY THE QUEEN OF THE BELGIANS. The most important industry of the Belgian women is the lace-making, in which for so many years they have excelled. A good opportunity is offered to the connoisseur for the study of many rare and interesting examples of the rich laces for which Brussels, Ghent, Bruges, and so many other Flemish towns have long been famous. A dress of point d'Angleterre, lent by the Queen, is a triumph of the lace-maker's art. The coats of arms of the different Belgian provinces are wrought in the border. A veil of the Virgin, made in the last century, and lent by the Church of Saint Nicholas, has a very quaint and lovely Flemish design. Very remarkable pieces of the different styles of point lace of Malines, Valenciennes, Binche, Guipere, etc., may be studied here. The great revival of lace-making all over Europe is very clearly illustrated at the World's Fair. 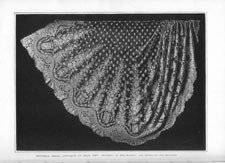 We learn from the exhibits at the Woman's Building that in Ireland, Italy, France, and Russia, a large amount of fine lace is being made. In Belgium the art, while it has never languished as in these other countries, has felt the same quickening impulse which in at least two countries of Europe has revived a practically extinct industry. The imitation or machine-made laces, which for some time threatened the existence of the real lace industries, have now been relegated to their proper sphere, and no more take the place of the real laces than the paste-jewel takes the place of the diamond. Belgium is finely represented in the library, and not only by her large and interesting collection of books, but by the reports and statistics, which have been compiled with great care, and which to the student of sociology reveal much that throws light upon the condition of the people. PROPERTY OF TREASURY OF ST. NICHOLAS CHURCH. BELGIUM.